“I took a call from Dey and Jorge shortly after the storm. 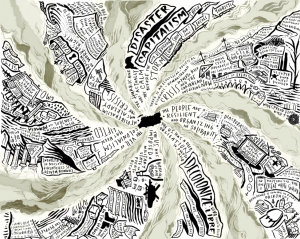 I had been worrying about them and was relieved to hear their voices, though heartbroken to hear the stress and exhaustion and overwhelm in between their words, which were encouraging me to create a map to show and clarify the political moment of post-Maria reality. From media coverage of the storm and its aftermath, I pieced together several core truths revealed by Hurricane Maria and the supporting realities that uphold them, focusing mostly on disaster capitalism, the context of US imperialism in the Caribbean, and the US-imposed economic austerity that has wreaked havoc in Puerto Rico in recent years. “Recibí una llamada de Jorge y Dey poco después de la tormenta. Estaba preocupada por ellas, y me tranquilizó escuchar sus voces, aunque con el corazón roto al oír la tensión, el agotamiento y el agobio en ellas. Esto me motivó a crear un mapa para mostrar y clarificar la situación política de la realidad post-María. Tomando de la cobertura mediática de la tormenta y sus consecuencias, reconstruí varias verdades fundamentales reveladas por el huracán María y las realidades que las sostienen, centrándome principalmente en el capitalismo del desastre, el contexto del imperialismo estadounidense en el Caribe y la austeridad económica impuesta por Estados Unidos, que ha causado estragos en Puerto Rico en los últimos años. AgitArte’s Artistic Director, Jorge Díaz talks to Lewis Wallace for Scalawag about the links between the current crisis and the island’s colonial history—and how art and cultural work are a part of combating white supremacy. 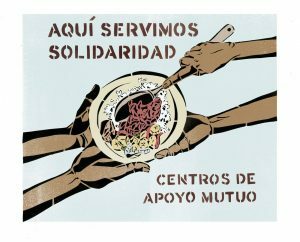 Faced with the collapse of the State and the abuses of FEMA in post-Maria Puerto Rico, we have organized ourselves in self-managed spaces around the Island known as Centros de Apoyo Mutuo (Mutual Support Centers + CAM). In addition to providing support to overcome urgent needs in the communities, we promote their empowerment and create discussion spaces to generate critical thinking and the understanding that we are facing a political disaster that is even more dangerous than the natural disaster. * Social dining rooms where we serve food prepared for free. * Collection centers where we collect local and diaspora aid to distribute in the communities according to need. * Permanent Solidarity Brigades to open roads by force of ax and machete; and support in agriculture and housing reconstruction. Some CAMs also offer the services of popular health clinics, cultural activities, community garden workshops and education for children. We are located in Caguas, Río Piedras, Mayagüez, Humacao, Utuado, Lares, Naranjito and Old San Juan. We are not in a Shock State. 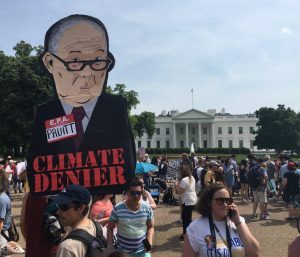 We are organizing to combat the onslaught of disaster capitalism and its henchmen. Help us with your donation!!! Thank you Community Book Center + NOLA movement builders! 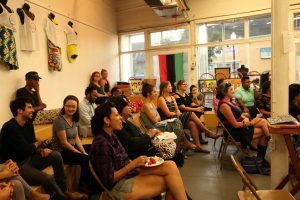 Last night, we exchanged with local organizers and movement builders (Karla Rosas from Congreso and Angela Kinlaw from Take ‘Em Down NOLA) in New Orleans for a When We Fight, We Win! 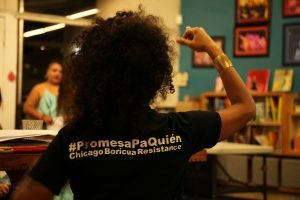 book event and update on the status of Puerto Rico post-Hurricane Maria, now under US military occupation. 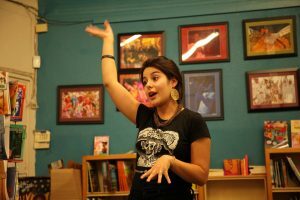 Hosted by the Community Book Center and emceed by the amazing Paulina Helm-Hernandez, AgitArte Board Member and Special Projects Director of Southerners On New Ground (SONG), the event included a call-in from AgitArte Founder and Artistic Director Jorge Díaz Ortiz who is organizing on the ground in Puerto Rico with many others, feeding hundreds per day and providing space and leadership for ground-up mutual aid in Puerto Rico. Dey Hernandez, AgitArte Project Coordinator / Designer and Art Director of When We Fight, We Win! 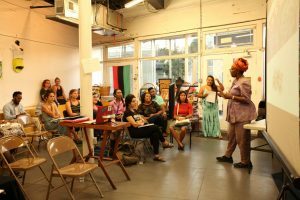 shared ways folks can join and support AgitArte’s work, and read a moving piece about her experience since the storm hit her country two weeks ago. 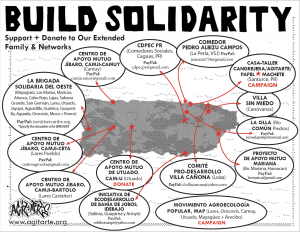 In the next few days, AgitArte will be meeting with folks who experienced and organized in New Orleans after Hurricane Katrina to build solidarity and gather resources and knowledge to share with our people in Puerto Rico. Thank you to all who joined us in New Orleans! Nunca hemos estado bajo ilusión sobre este momento político. Desde el día de la elección en el 2016, hemos estado preparándonos y desarrollando una estrategia para el incremento en la violencia racial descarada que se ha manifestado, la cual está perpetuada por individuos y el estado. La semana pasada, la seguridad de miles de personas que se escapaban de las aguas crecientes en Texas se puso en peligro debido a la ejecución insensible e innecesaria de retenes de inmigración. El día de ayer, Trump enfatizó su agenda racista al desencadenar otra tormenta de devastación en inmigrantes jóvenes al rescindir DACA y reemplazarla con la incertidumbre y el injusto estado de derecho. Estamos solidarixs con millones de sureñxs y gente de alrededor del país demandando una vía justa para la residencia legal y ciudadanía, y acabar con este régimen supremacista blanco que no es sólo anti-inmigrante, sino también explícitamente anti-negrx, anti-pobre, anti-queer, y anti-trans. A nuestra membresía, nuestra familia, política y nuestra base: luchamos por DACA porque creemos en la plena inclusión de todas las personas en la gestión pública y la auto-determinación para millones de personas de nuestra familia indocumentada. Entendimos que DACA era una oportunidad – práctica y política – para amortiguar contra la cultura del miedo impuesta en nuestra existencia diaria por el estado. Pero nunca hemos olvidado que esta lucha es para la liberación de TODXS nosotrxs, y que nuestro mandato es acabar con la criminalización racial, supremacía blanca, y violencia de género. Hemos luchado por la auto-determinación en cada esfera de nuestra vidas públicas y privadas; sabemos lo que se necesita para organizarnos por nuestra seguridad y dignidad cada día. Hacemos un llamado a las instituciones privadas y públicas, así como al liderazgo local, estatal y nacional de solidarizarse con nuestras comunidades en resistencia y luchar a nuestro lado para anular esta cínica maniobra política. Hace mucho tiempo que finalizó el tiempo para la timidez y la política de respetabilidad. Ahora es el tiempo de renovar el compromiso para luchar para y defendernos a nosotrxs, nuestras familias, y a nuestrxs camaradas. We have never been confused about this political moment. 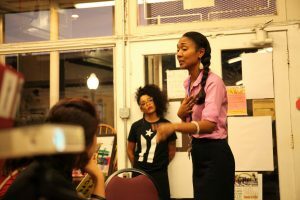 Since Election Day 2016, we have been preparing and strategizing for the increase in unapologetic race-based violence – perpetuated by individuals and the state – that has come to pass. Last week, the safety of the thousands fleeing the rising waters in Texas was jeopardized by the callous and unnecessary enforcement of immigration checkpoints. Yesterday, Trump doubled down on his racist agenda in unleashing another storm of devastation on young immigrants by rescinding DACA and replacing it with uncertainty and the rule of unjust law. We stand with the millions of Southerners and people across this country demanding a fair path to legal residency and citizenship, and an end to this white supremacist political regime that is not only anti-immigrant, but also explicitly anti-Black, anti-poor, anti-queer, and anti-trans. To our membership, political family, and base: we fought for DACA because we believe in the full inclusion of all peoples in governance and in self-determination for millions of our undocumented kinfolk. We understood DACA as an opportunity – practical and political – to buffer against the culture of fear imposed upon our daily existence by the state. But we have never forgotten that this struggle is about liberation for ALL of us, that our mandate is to end racialized criminalization, white supremacy, and gender based violence. We have fought for self-determination in every sphere of our public and private lives; we know what is required to organize for our safety and dignity every day. We call on private and public institutions, along with local, state and national political leadership to stand with our communities in resistance and to fight alongside us to overturn this cynical political maneuver. The time for timidity and respectability politics has long been over. Now is the time to renew commitment to fight for and defend ourselves, our families, our neighbors, and our comrades. Building off the success of the book When We Fight, Twenty-First-Century Social Movements and the Activists That Are Transforming Our World, AgitArte presents the book’s Arts & Culture Tour highlighting the artwork featured in the book, as well as new cultural projects and artistic productions of struggle and solidarity. 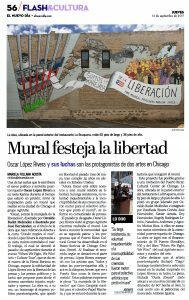 The tour launches next week with the inauguration of a mural in Chicago dedicated to Oscar López Rivera, freedom for political prisoners and dismantling the Prison Industrial Complex. The mural, ‘Oscar, somos la marejada de la liberación’, ‘Oscar, we are the groundswell of liberation’ is a collaboration between The Puerto Rican Cultural Center in Chicago and AgitArte, and it is sponsored by When We Fight We Win and El Puente in Brooklyn. The metaphor of the sea in the title to the mural refers to a letter Oscar wrote to his granddaughter while he was in prison, in which he makes reference to missing the smell of the sea and being able to feel it on his lips. He concludes by stating that he probably will have to wait years to be able to finally be in it again. Now Oscar is free and we are making a mural to celebrate his freedom. The title is directed for Oscar, and inspired by his resilience and faith in freedom. But we also use the metaphor to answer the calling he made to us in AgitArte’s workshop in Santurce PR weeks ago, to fight for the freedom of political prisoners who are still behind bars. We, a sea of people are essential for the tidal wave of freedom to tear down the oppressive systems which exploit and colonize us. The mural was designed by Osvaldo Budet Melendez and illustrated by José ‘Primo’ Hernández for AgitArte. The painting of the mural is being led by Osvaldo Budet with community members and artists including Jose “Primo Hernández” Estefania Rivera and Xavier Arzola. ‘Oscar, we are the groundswell of liberation’ will be inaugurated on Friday, September 1st to kick off the annual Fiesta Boricua, in the historical Paseo Boricua, heart of the Puerto Rican community in Chicago. Join us for a press conference at 11am on 2729-2731 Division St., and shortly after, the When We Fight We Win Arts and Culture Tour kick-off. A storytelling presentation based on the mural will be performed by Puerto Rico based theater group Papel Machete. We will also be joined by community leaders and organizers speaking to the importance of freeing political prisoners and our educational, organizing and visionary efforts to end the prison industrial complex. Oscar will join us for the celebration of this commemoratory mural and the Festival throughout the weekend. Come celebrate with us this special moment and join us in the chant of victory and title to our book: ¡Cuando luchamos, ganamos!